Fragments of Bone discusses African religions as forms of resistance and survival in the face of Western cultural hegemony and imperialism. The collection is unique in presenting the voices of scholars primarily outside of the Western tradition, speaking on the issues they regard as important. Bellegarde-Smith, himself a priest in the Haitian Vodou religion, brings together thirteen contributors from different disciplines, genders, and nationalities. 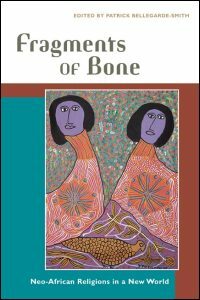 Fragments of Bone draws on an impressive range of sources including research, fieldwork, personal interviews, and spiritual introspection to support the provocative thesis that the fragments of the ancestral traditions are fluidly interwoven in the New World African religions as creolized rituals, symbolic systems, and cultural identities. Don’t Forget!!!!! African Diaspora, Ph.D. loves commentary! If you’ve read a piece featured here and have commendation or condemnation for it, please leave it in the comments. If you would like to submit something longer, a lá the infamous book review, or if you would like to suggest a work of African diaspora scholarship to be reviewed, just send us an email! Contact Jessica at jmjohnso[at no spam please]umd.edu. Graduate students especially welcome.